Forty Eight hours into the rally and the yachts are spreading out across the Caribbean Sea; last night we saw no other lights. We are still running along the rumb line and had no success at fishing in the initial period. See photo below. The weather has been very good for the trip so far and below is the forecast we received from our forecaster Bruce Buckley domiciled in Western Australia. All looks satisfactory for the trip to Panama with no adverse weather on the horizon. The latest satellite imagery shows there are quite a few showers around with very isolated thunderstorms but nothing organised. The showers look like decreasing markedly after 2000UTC with long fine breaks between the showers. The fresh east to ENE trade winds look set to continue, strengthening a little once past the waypoint and heading towards Panama. Friday (from 0900UTC): The winds should be easterly to E/NE around 17 to 22 knots with some variability in the direction. Increased shower activity with isolated thunderstorms, most likely in the period to 2000UTC, with showers decreasing after this time. Local gusts to the mid 30's near showers. The winds should ease back into the 13/18 knot range by 1800UTC. Just finished the noon time position report and from those which are reporting we are managing to hold our own but some of the big boys are so far ahead that they don't report as they can't hear the radio on the 4 meg. The weather is as forecast and very muggy particularly if there is rain about and we try and sleep in a closed up cabin, not nice. 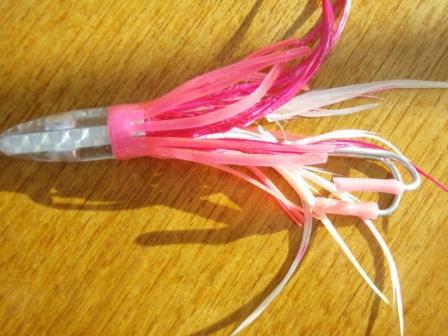 Our new lure which we used without success for 10 hours. Note the pink plastic hook protectors which this dummy forgot to take off the barbs! From the look of the tatty lure it had been hit quite a few times.